Hvalbåten «Cheynes» utenfor landstasjonen ved Albany, Australia. Bygget ved Akers Mek. i Oslo i 1921. Døpt «Toern». Kjøpt av Thor Dahl i 1938. 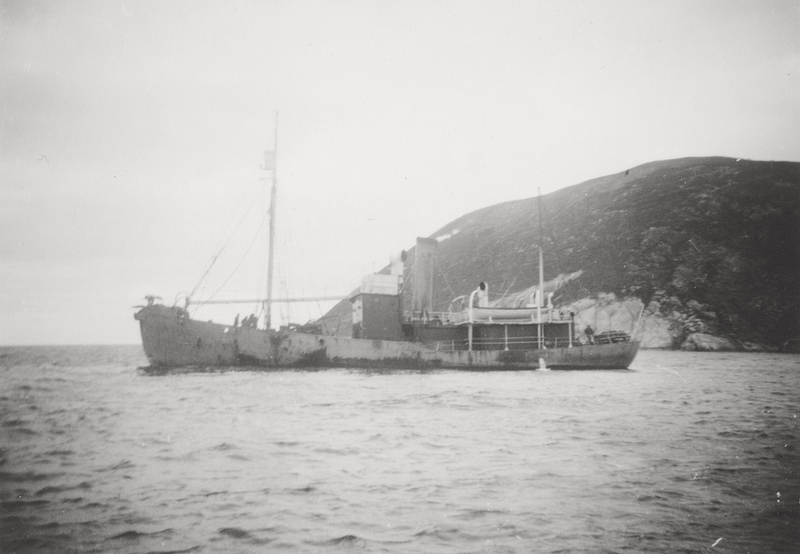 Kjøpt av Cheynes Beach Whaling Company i 1952. Var i drift til 1961. Senket utenfor Albany. Tusen takk til Liam Ryan for bildet. Let me extend my gratitude to Liam Ryan for contributing photos to the site. Liam’s father, John Ronsly Ryan (in the photograph below), took the photos on a Box Brownie 620 in July 1956 on a trip to Western Australia. – Your statement «It is not this site’s intention to “take sides”, as it were, in the whaling debate. It’s area of interest is solely of a historical photographic nature.» fits in with my philosophy of why I have the images available in the first place. I myself do not support whaling, but acknowledge the history, and value of the images. Bilde tatt på landstasjonen til Cheynes Beach Whaling Company, utenfor Albany i Vest-Australia. En slepebåt på vei inn til plan med en knølhval.